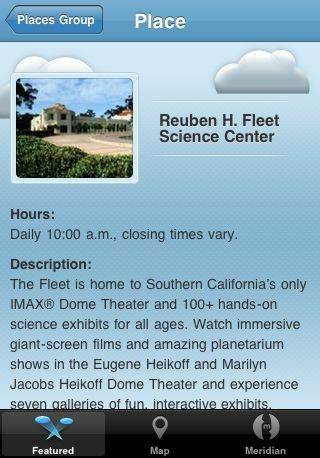 Audiences expect to find information about museum events and exhibitions in many formats using a variety of devices. Some people may use their local community paper to find a listing of the next weekend’s events, but many others will use their smartphones, tablets, or laptops—or seek instant access to the information once they’ve arrived at a destination. Given museums’ limited staffing, reentering data is not an efficient use of resources. But what are the best practices for creating content for multiple platforms? 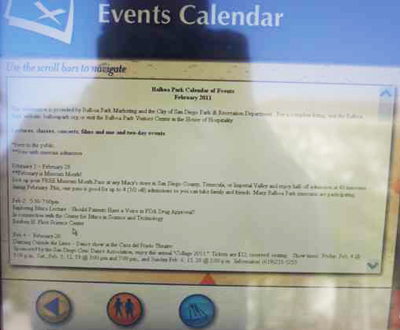 At the Balboa Park Online Collaborative, we have created a flow through which calendar events are created for the Balboa Park website and then fed out to a branded Balboa Park iPhone app, Spotlight Mobile’s Meridian platform (for iOS and Android devices), and onsite interactive kiosks. We have also made duplicate versions of this feed available to media outlets for their use in creating community calendars. This paper and session will review the steps through which participants could develop a similar flow for their organizations’ content and discuss aspects of the content that need to be optimized for mobile apps and kiosks. Located just outside of downtown San Diego, Balboa Park is home to fifteen major museums and dozens of other cultural and recreational organizations. On any given day, there are at least forty events and exhibitions happening in the Park. Some days there are more than 100. This volume of events—which vary in price, location, hours, and target audiences—presented a problem to the Balboa Park Marketing office and others charged with disseminating this information to visitors and press. This problem was exacerbated when organizations would attempt to communicate last-minute event changes. Recognizing these challenges and the growing opportunities for connecting with people wherever they are, via smartphone apps and other platforms, the Balboa Park Online Collaborative (BPOC) began working on a solution. This was one of the first projects for BPOC, which started in 2009 to work on collaborative technology projects with Balboa Park museums and other cultural organizations. Project activities included the identification of an appropriate content management system (CMS), development of a robust calendar module for the CMS, and creation of feeds from the online calendar to other platforms. One of BPOC’s core areas of operations for its first three years was relaunching member websites on Drupal, a common open-source platform, to simplify administration, design, and content production and management. Deploying a common CMS for multiple organizations in Balboa Park, including Balboa Park Central, enables organizations with limited technical resources to support robust content production and allows BPOC to provide technical support more effectively to members. With the shared platform, we can also build online tools that can be deployed across multiple institutions. While content management systems Wordpress and Joomla are used for more websites overall (Web Technology Surveys, 2012), Drupal has gained popularity in the museum community (Lans, 2010. 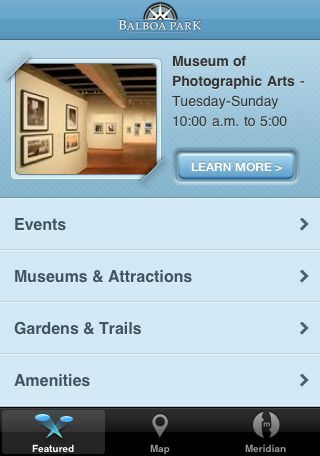 The Indianapolis Museum of Art’s TAP mobile platform is based on Drupal, as is the video art content-sharing site ArtBabble (http://www.artbabble.org). Since selecting Drupal as our CMS, we have built or relaunched more than twenty websites on the open-source platform. Our members have found it easy to use and edit; many staff with little or no web experience are now editing pages on a daily basis. 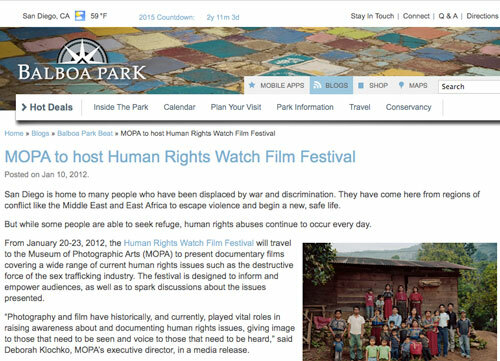 For Balboapark.org, a site that attracts about 100,000 visitors per month for information about more than eighty organizations and attractions, we knew that using Drupal would enable us to achieve the complex goals we set out, such as the integration of an open-source ad server (Open X) and the installation of a collaborative calendar. 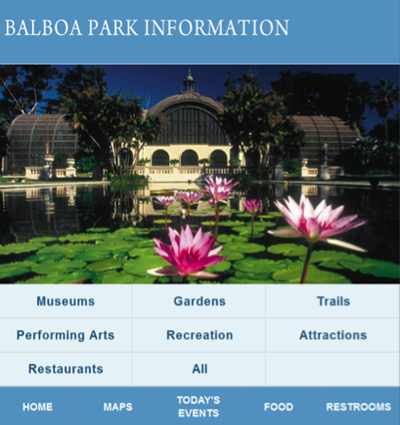 In 2009, BPOC began working with Palantir, a Chicago-based web-development firm, to develop an advanced, Drupal-based calendar system for Balboapark.org. A survey of existing modules (add-ons that extend the functionality of a Drupal based-site) showed that there were not any calendar solutions available that would meet all of the needs BPOC identified, such as the ability to create events that take place on multiple days with complex repeating patterns; ability to transfer events from members/satellites to a central calendar; ability for an administrator to edit events transferred to the central calendar; ability for selected central data to be pulled into satellite sites; and ability to create feeds from the central calendar to other potential partners. Most calendar systems have the option of creating repeating events. Drupal’s event and date modules have had this capability for years. The challenge that BPOC encountered was that many cultural organizations had events that were much more complicated than “every first Friday of the month.” For example, a theatre may have a play showing every Thursday, Friday, and Saturday at 8:00 p.m.; Sundays at 2:00 p.m. and 7:00 p.m.; and every other Wednesday at 2:00 p.m.. Date and time logic becomes even more complex once time zones, holiday schedules, and date-without-time events are added to the mix. To solve this issue, Palantir used the Drupal iCal module to generate the appropriate instance “nodes” (Drupal-speak for pieces of content) for each instance that the event is designated to repeat. Each of these nodes has a single-value date field while containing the same core data, such as event title and location. Those nodes can be shown in calendar views and edited individually, just like other nodes created with Drupal. The calendar that Palantir created provides a single place for editing complex repeating event rules with a separate node for each instance. BPOC and Palantir then looked at a second issue: moving content between websites. Although each museum within Balboa Park is able to create its own events independently, the central portal, Balboapark.org, needs to offer visitors a comprehensive and sortable view of all events happening in the Park during their stay. The site also provides a central repository to then re-syndicate that information out to other sites and platforms. Drupal already had the ability to move content between sites using feeds (file formats used to push data to multiple sites), but there were a number of questions to address. Can you have a feed for potentially hundreds of events? How long would the feed need to be? The new cultural calendar incorporates several Drupal modules enabling administrators to “push” or copy complete event nodes in bulk between Drupal sites. The simple syndication of this content lessens the laborious work of posting text and photos to multiple calendars, and allows for event changes to be updated across several calendars at once. We are in the process of installing the collaborative calendar on our member museum sites to enable this flow of content. However this is a time-consuming undertaking that requires installing the calendar on the site, “theming” or changing the look of the calendar to match the site design, and coordinating with the museum staff to enter all upcoming events into the new calendar. Recognizing that these calendar event issues are not unique to Balboa Park, BPOC’s goal was to develop a free, open-source, cultural calendar that could be shared and adapted for other multi-institutional environments, including state or regional arts associations, library systems, and university settings. Step-by-step instructions regarding calendar installation are available in a 2011 Museums and the Web paper titled “Installing the Collaborative Calendar” (Bostick and Garfield, 2011). 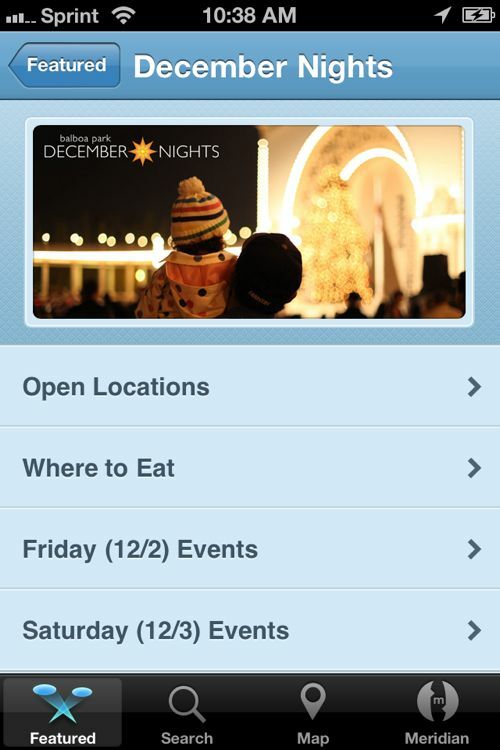 To develop the Balboa Park iPhone app, we worked with the Portland-based company Spotlight Mobile. Our goal was to develop a basic app that would provide visitors with quick access to information about the Park’s numerous attractions, restaurants, and events. 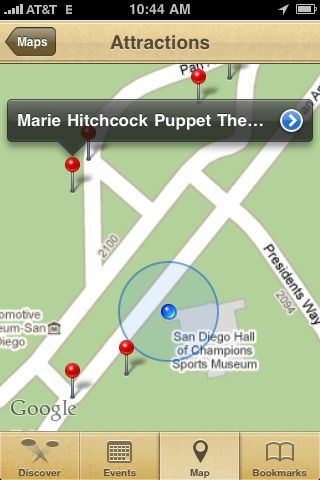 For ease and sustainability reasons, all content for the iPhone app would flow directly from Balboapark.org via feeds built using the Drupal Views module. DESCRIPTION:Presented by Jean-Michel Cousteau\,¬†/Sharks 3D/¬†offers audiences an \n astonishing up-close encounter with the lions and tigers of the opean. \n Visitors will come face-to-face with a multitude of shark species\, including \n the Great White\, Hammerhead\, and the Whale Shark. The film depicts sharks as \n they really are\; not malicious man-eating creatures\, but wild\, fascinating \n and endangered animals that have been in existence millions of years before \n dinosaurs roamed the Earth. The team at Spotlight Mobile then parses this data to match the app’s user interface. To make changes, I just swap the event title, subtitle, image, and corresponding UID, which can be easily determined by looking at the iCal feed. This maintenance takes about twenty minutes per month. 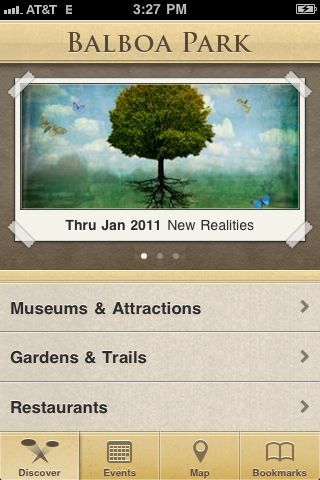 More than 30,000 people have downloaded the Balboa Park iPhone app, and it maintains a four-star rating in the App Store. Provide a free mobile app for an increasing number of Android users. Over one year, we saw the share of mobile traffic to Balboapark.org from Android devices grow by more than 25 percent. Provide better navigation tools for our visitors. While our first app had a detailed Google map, people were still having trouble finding the quickest routes to their destinations. The Meridian app offers users turn-by-turn directions from and to any location in the guide. Develop a better sense of how people are using apps. We can only judge the success of the first app by number of downloads; the Meridian app offers in-app analytics. 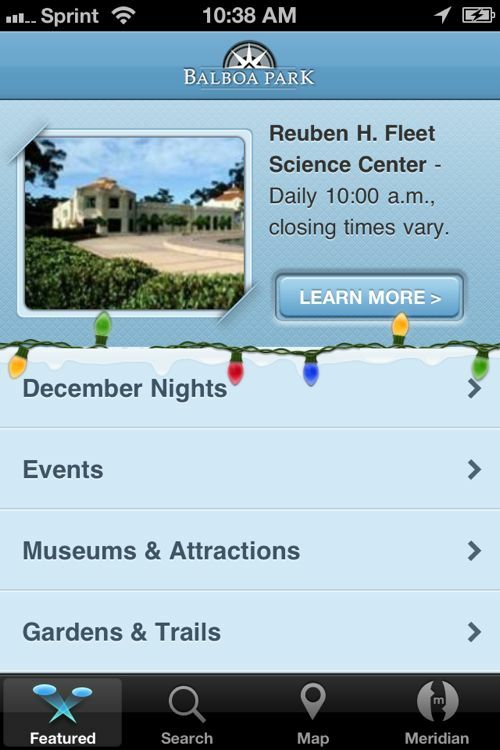 To add the Balboa Park content to the Meridian app, we used the same event feed that we set up for the branded Balboa Park iPhone app (http://www.balboapark.org/calendar/ical) and set up a new organization feed to accommodate the image handling requirements of the Meridian app (http://www.balboapark.org/meridian/rss/organizations). The only time-consuming aspect of developing the Meridian guide involved putting placemarks for each organization on the Meridian guide maps of Balboa Park; the unique navigation tools included custom mapping that could not ingest the GPS coordinates of each organization. The Meridian team is currently working on a feed reader that makes it easier to load bulk placemarks and other content using GPS coordinates. After working with a number of organizations, Meridian Chief Executive Officer Kiyo Kubo said that his team has learned the importance of understanding how varied these feeds can be, and that great flexibility is required for loading and presenting a range of fields. The use of a CMS also allows us to manipulate content for special purposes. For December Nights—an annual event attracting about 300,000 people over two days—we worked with the Meridian Apps team to develop a special December Nights edition of the Balboa Park Meridian guide. While we previously only showed a single day of events, the December Nights guide featured sections for both Friday and Saturday, and for each organization we created a new field that we filled with December Nights–specific details. We initially tried to recoup costs with the first iPhone app, but we are less optimistic about using mobile apps to generate revenue. Consequently, we are willing to share our feeds with other app makers if it means broader dissemination of our content. We plan to continue to develop data sets and feeds that students or start-up app makers can use to develop exciting new apps that will benefit future visitors. 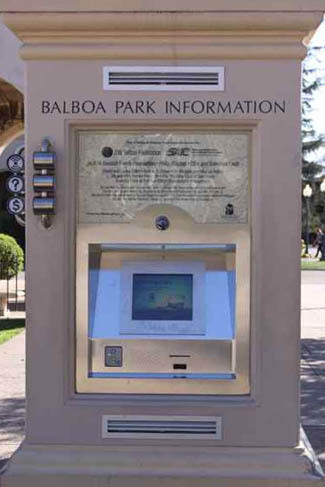 In 2011, the volunteer group Friends of Balboa Park approached BPOC to develop a new interface for their outdoor interactive kiosks in the Park. The Friends of Balboa Park already had three such kiosks in the Park and were in the process of installing two additional ones. Because the Park covers about 1,200 acres, the kiosks were meant to augment the services that the Balboa Park Visitors Center provides and also provide information during hours when the Visitors Center is not open. Prior to the Friends of Balboa working with BPOC, the kiosks had been updated on a monthly basis. The on-screen calendar was a multi-page PDF with all events listed in chronological order. It was a time-intensive process for Balboa Park Marketing and the Friends of Balboa Park to put together these PDFs each month, and the resulting product was less than user-friendly. 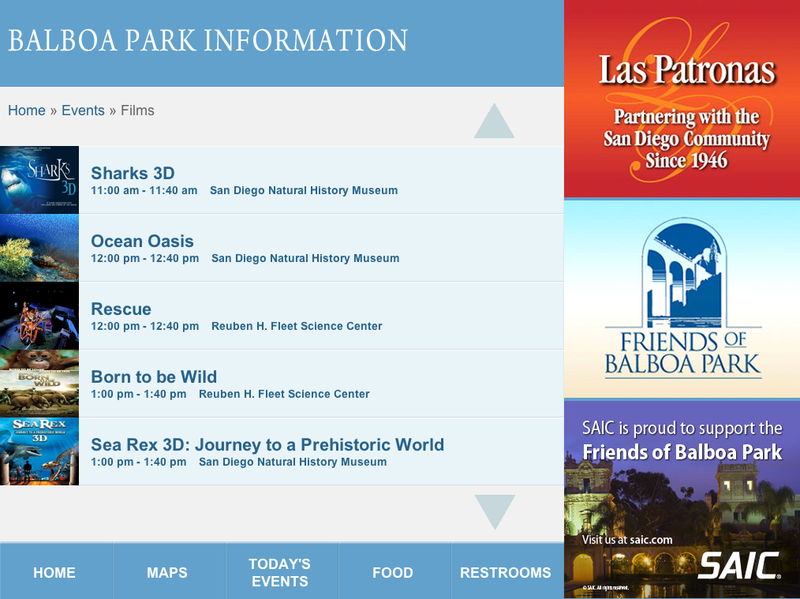 Our team used Drupal to develop the user interface: essentially a scaled down version of Balboapark.org. 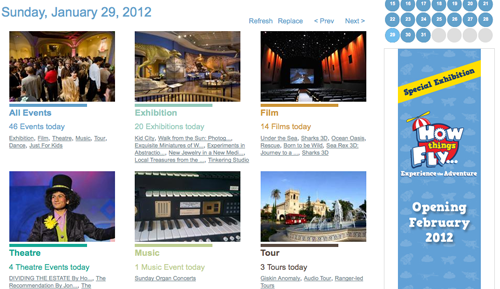 We then extended Drupal core with the Feeds module, allowing the kiosks to accept and aggregate feeds from Balboapark.org. 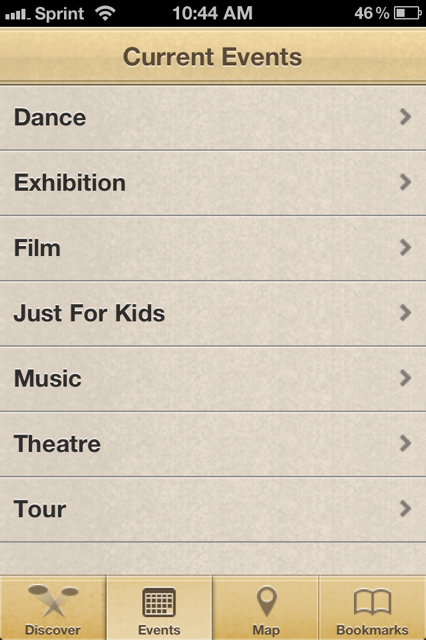 The data sources for the kiosks were the same as for the mobile apps (events calendar and organization pages); however, the Drupal Feeds aggregator doesn’t use the iCal format, so the event feed was rebuilt as RSS (RDF Site Summary, or Really Simple Syndication). Several local media outlets and tourism bureaus have expressed interest in ingesting our feeds. We have provided the event and organization feeds to them, and they are in the process of configuring the displays for the feeds. In the future, these event feeds may also be used for regional and national cultural event databases For example, BPOC will be a content partner for Project Audience’s Southern California pilot project to develop an online resource to collect, manage, and publish regional arts information. This pilot project will take place in 2012 to test the resource’s scalability and examine the possibility of a national aggregation service. Maintaining a document with a list of all of the feeds flowing from a website. This document should also include copies of the feed for reference purposes. Make sure all of the developers working on the organization website and mobile apps are aware of the feeds and communicate with each other if they make any significant changes to any platform sending or ingesting the feeds. Test, test, test! Particularly when launching a mobile app, it is important to test a variety of events (or whatever the content may be) before going live. It’s important to consider which content fields should be required or optional, and what content can be put in place if the “optional” content is not filled (e.g., standard fill-in photos). In this era of information and information overload, it becomes imperative for online marketing professionals to repurpose and syndicate content whenever appropriate. How else can we reach people via email, organization websites, media sites, Facebook, Twitter, Tumblr, Flickr, Pinterest, and the Next Big Thing? When we create new content at BPOC, we are always acutely aware that whatever we are creating—photos, videos, narratives, etc.—can and should be repurposed. If you spend time creating a perfect e-newsletter, that content shouldn’t be discarded the minute you press Send. BPOC is currently working with the Balboa Park Visitors Center to repurpose audio-tour content that has traditionally been available via rented audio-tour wands. From 2005 to 2006, the Visitors Center worked with a production company to develop tours for adults and children that tell the story of Balboa Park’s history. While the tours feature high-quality content containing fascinating historical, cultural, and horticultural information about Balboa Park’s buildings and gardens, it is expensive for the Visitors Center to maintain the wands, and a decreasing number of visitors are renting them. The staff reports that the wands are seen as antiquated technology, and visitors seem to expect that the content will be equally outdated. Using the Indianapolis Museum of Art’s TourML and TAP toolkit, BPOC will repackage the existing audio-tour files with photos and text, and relaunch the content as a TAP tour. This repurposing will just require some minor editing to remove irrelevant prompts such as “Press 105 to hear more.” We hope that this new tour format will reach a greater number of Park visitors who have grown accustomed to using their personal mobile devices to find information. Most museums have some sort of blog, whether it’s updated daily, weekly, monthly, or whenever someone happens to be procrastinating on a grant proposal. 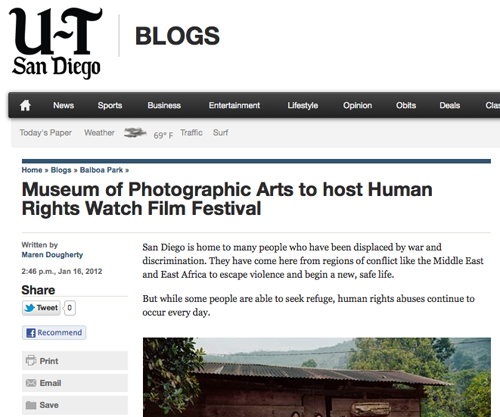 I operate a blog for Balboa Park called Balboa Park Beat. The blog attracts a consistent audience of our social-media followers on Facebook and Twitter, but I wanted it to have a broader reach, to people who were not already so familiar with the Park. Cognizant of the budget and staffing cuts that have been taking place over the past few years at media outlets, BPOC Director Rich Cherry and I met with editors at several local outlets to gauge their interest in republishing my blog posts. We soon formed partnerships with both the UT San Diego (formerly San Diego Union-Tribune) and SanDiego.com with the understanding that the stories would adhere to journalism style and avoid a “PR-sounding voice.” Each post is now published to Balboapark.org, utsandiego.com, and sandiego.com, reaching a much broader audience of San Diego locals and visitors. We hope and expect that our media partners will eventually be able to accept feeds of content so that this duplicate entry will not be required. As more media outlets start up community blogs and other, more inexpensive ways of generating content, similar opportunities for such partnerships likely exist in other parts of the country. With the escalating use of mobile devices and many channels through which people are now gleaning information comes a need for cultural institutions to amplify their messaging to multiple platforms. BPOC has automated the process of repurposing event and basic organization content using a content management system and feeds from a central portal to smartphone apps and kiosks. Automated repurposing of content lessens the tedious work involved with reposting the same content to multiple sites, but care must be taken to avoid the domino effect that can occur when one feed change affects the display of content on other sites and applications.